Q: How does rain, snow and ice affect my antenna? A: There are two considerations to be taken into account: how the performance of an antenna is affected by adverse weather, and the impact upon link loss (or path loss). Light rain or snow will have minimal, if any, effect upon the performance of your antenna. Depending upon the path from your antenna to the other location, light rain or snow should not cause much degradation in signal strength but the longer the path, the more likely that rain or snow can reduce signal strength at both ends. In addition, the higher the frequency, the more that path loss increases with precipitation. Heavy rain or snow, or an ice storm, can cause considerable signal loss over the link. 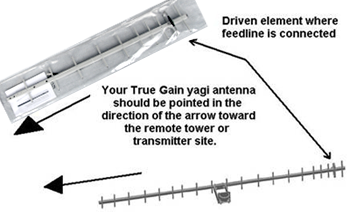 Your True Gain antenna’s performance should not be affected by heavy rain but snow that sticks to any antenna (not just True Gain) can, and likely will, reduce performance to some extent. A thin coating of ice should have minimal effect but the thicker the ice, the more any antenna’s tuning is disturbed and the more that performance degradation occurs. Q: How do I know where to point my antenna? A: You first need to find out where the closest tower or transmitter is that provides the type of service you intend to use, such as GSM, cellular, etc. Your service provider can tell you the exact coordinates or location of the closest tower to your location, and may also be able to tell you in what compass direction to point your antenna. Some providers may have an online inactive web site that will help you find what direction your antenna needs to be pointed. Now that you know the direction you want to point your antenna, you need to understand which end of the antenna is to be pointed toward the tower or transmitter. See the illustrations at right. If you have a signal-strength indicator on your radio or phone, you can slowly turn the yagi while watching the indicator until the signal is strongest. This might not be the exact direction of the tower or transmitter from your antenna, and you should be careful to check that you continue to obtain good communications quality. Sometimes, if the exact path to the tower or transmitter is obscured by buildings or foliage, a stronger signal in another direction might be the result of the signal being reflected from other objects. In that case, the reflected signal could interfere with the direct-path signal and prevent your radio from being able to properly decode the signal from the tower or transmitter. Q: I find a much stronger signal coming from a different direction other than the correct direction toward the tower. A: When this happens, you are likely picking up a signal reflected from a building or other nearby object. If this signal is strong enough and your communications with the tower or transmitter is good, you can use this direction instead of pointing straight toward the tower or transmitter. Q: When I first put up my yagi last winter, I had excellent communications. Now that it’s summer, I find communications sometimes is iffy or intermittent. What’s going on? A: Most likely, there are trees or other foliage in the direct path between your antenna and the remote tower or transmitter, and leaves on the trees or bushes is causing increased path loss to the point where the signal is no longer clear at your radio or cell. You can try re-aiming your antenna to see whether you can get a better signal. If not, you may have to either raise your antenna higher in the air to “look” over trees, or even move your antenna to another location where it “sees” the remote tower or transmitter better. Q: Can I mount my antenna on the same mast as my TV or other radio antenna? A: Certainly! It is possible, however, that your radio or cellular equipment might interfere with the other equipment, particularly on the higher UHF TV channels, for example; or vice versa. If so, try moving one or both antennas up or down the pole to minimize the interference; or try re-aiming either or both antennas slightly. Also, do not tape the coax feedlines together, because even as good as coax cable is today, there is still a small amount of leakage through the shield which can couple into another coax taped to it. Instead, run each coax cable down opposite sides of the mast, so the mast will act as a shield between the two coaxes. In the worst case, you might have to install a filter at the radio or TV in order to prevent the other equipment’s signals from getting into the interfered-with equipment. Q: I live in a multi-story apartment building. Can I mount my rear-mounted yagi on the balcony railing? If so, do you make brackets for that? A: If the remote tower or transmitter is in a direction that you can point your antenna toward when mounted, then yes, that should work fine. We don’t stock such specialized brackets but you can contact our representatives, who will be happy to work with you to try to arrange something. Q: I’m not getting any reception from the remote tower even when my antenna is pointed toward it. What’s wrong? A: It is difficult to say exactly what is causing the problem without more information. Are any of your neighbors able to communicate with the remote tower or transmitter? Do they, too, have an antenna similar to yours? Coax cable has internal loss that reduces signal strength, both on transmission and reception, and you should keep any coax as short as practical. This is even more important at higher frequencies such as 2.4 GHz but is equally as important at 900 MHz. You should keep the length of coax for 900 MHz equipment under 100 feet long if possible. 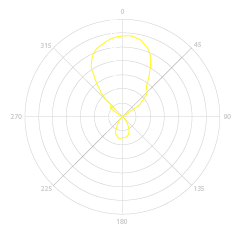 Is your antenna cross-polarized?  Polarization should be matched on both ends of the path; for example, if the remote tower’s antennas for your service are vertically-polarized, your antenna must be mounted so its elements are also vertical; and vice versa in the case of horizontal polarization. Even if the remote tower puts in a strong signal at your location, if you don’t match the remote tower antenna polarization, signal strength at your equipment can be too low for satisfactory communications. It is possible, but unlikely, that if your antenna is pointed directly at power lines, noise generated by “leaky” power line equipment could be “blanketing” the signal from the remote tower or transmitter. This is unlikely, however, because power lines generally do not generate much noise in the 900 MHz and up frequency range; but it’s not unknown to occur. If this is the case, then the power company has to be alerted so that they can track down and repair the source of their equipment that is generating the noise. Are you certain that your own equipment is working properly? If it is portable, you might try taking it closer to the remote tower or transmitter to see how strong the signal is when closer. You can take your True Gain antenna and hold and point it by hand (but be careful not to be get injured by the elements!). * Motorola specified its 6 Mbps Canopy range with two 9 dBi panel antennas at 10 miles. Note that in woodlands that same -116 dB system loss would yield ~1/4 mile Theoretical Range (less after a rain). In woodlands, changing one antenna to 17 dBi would add ~ 100 meters, 200 meters if 17's are used at both ends.